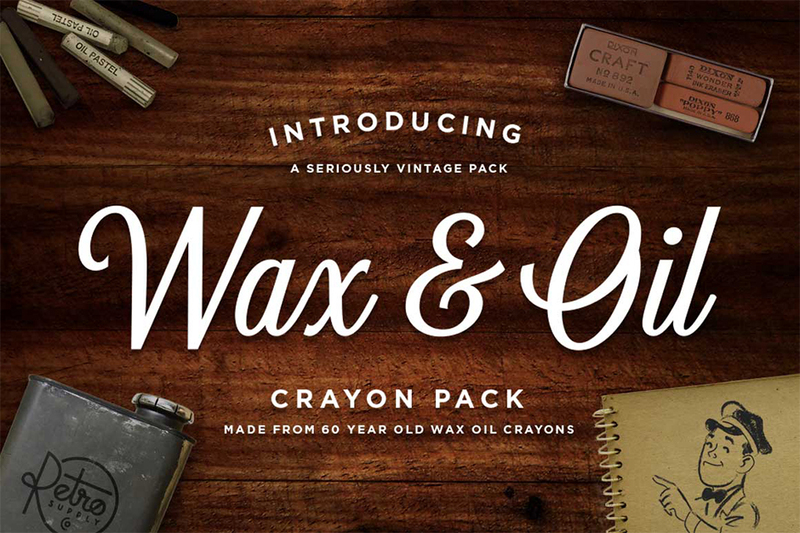 Super-Realistic Wax & Oil Crayon Brushes Made from 60-Year Old Crayons. These brushes are Vector art brushes created from 60-year old wax oil crayons. Inspired by a pack of 1950s wax oil crayons we found just sitting in a garage – hence the name – these crayon brushes recreate the rough, unfiltered sketches made by commercial artists in the mid 20th century, and will add that vital human touch to your designs and illustrations. • 15 vector art brushes created from 60-year wax oil crayons. • 15 no-stretch versions of brushes created from 60-year old wax oil crayons. • Brush Quick-Reference sheet that includes examples of each brush, the story of the brushes, and tips for using them. • Easy to follow instruction .PDF with pictures. We found real 60 year old wax oil crayons and converted them into art brushes for Illustrator. As you can see from the example images above the texture nails the look of wax oil crayons. We also worked hard to strike a good balance between realistic looking brushes and anchor points so they won’t slow down Illustrator. If you’ve used art brushes before you know that they stretch and compress depending on the length of the stroke. This doesn’t tend to be a problem unless the brush strokes are really long or really short. But these no-stretch versions were made using the Illustrator Pattern Brush feature. So no matter how long you make a stroke it won’t stretch even a little. It’s so much nicer to open up an AI or PDF file and see examples of all your brushes laid out (instead of loading them and guessing what they look like). Plus, we lay out the reference sheet so it looks great and include stories and tips for using the brushes. I absolutely hate when I buy a digital product and the instructions are a plain text file. It’s annoying to read and lazy. That’s why we made the instructions as a full color PDF with pictures and headings so you can easily find the information you need. Software compatibility: Adobe Illustrator CS6, CC and newer. 15 Vector Art Brushes Created from 60 Year Old Wax Oil Crayons. 15 No-Stretch Versions of Brushes Created from 60 Year Old Wax Oil Crayons. Easy to Follow Instructional PDF. File size is approx 104.2MB (104.3MB unzipped), offered as a single download.